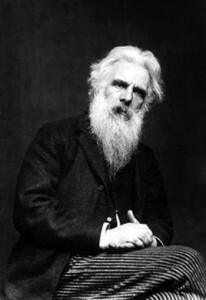 Born in England, Muybridge immigrated to the United States in his youth and came to international attention in 1868 with a spectacular large-scale portfolio of photographs of Yosemite Valley, California; however, it is on his experiments with photographing motion that Muybridge’s enduring reputation rests. In 1872, financier Leland Stanford commissioned him to settle a wager by proving that, at a given moment, all four legs of a trotting horse leave the ground simultaneously. By 1877, Muybridge created an array of cameras that captured the horse’s motion. Not only did this prove Stanford correct, it was the rudimentary beginning of the art and science of photographing motion. Muybridge later invented the zoopraxiscope, a device that projected images in rapid succession, thereby producing the illusion of live movement. The device was a precursor of cinema.